A recent addition to the RevZilla lineup, Forcefield armor has received a warm welcome from the motorcycle community. Their back protectors, the Forcefield Pro Sub 4 and the Forcefield Pro L2, cut the necessary rating of the CE 2 certification scale in half (or nearly in half with the Pro L2). That's some serious impact protection. 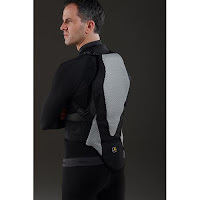 The qualification for CE Level 2 Back Protector Certification is very simple: the armor must allow less than 9 kiloNewtons of force to be transmitted to the body. The Forcefield Pro Sub 4 gets its name for a very simple reason. On average it transmits less than 4kN of energy to the body, generally around 3.38kN, less than the medically-defined average level where injury can occur. That's absolutely astonishing. 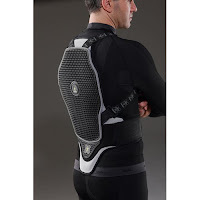 The Forcefield Pro L2, on the other hand, delivers only 4.93kN to the body, an equally amazing number for a consumer-level day-to-day rider's back protection. RIDE Magazine, a popular motorcycle gear and bike reviewing outfit, designated the Pro L2 a "Best Buy" in 2008. At the point, the protector was still up around 5.6kN of force transmitted to the body. Improvements over the last couple years have brought that number down even further which is impressive to say the least. Forcefield's impact protection comes from a material they refer to as Armourflex, which is essentially a combination of two materials: a triangular next-generation shock absorbing material fused with a base layer of soft Nitrex foam. This design allows force to evenly spread across the surface reducing direct impact to any one area. It is also super flexible and comfortable. Any part of the back protectors that come in contact with skin are wrapped in BeCool fabric, a polyamide fiber that pulls hot air away from your body and allows cool air to circulate through. Pretty high-tech stuff. Lastly, and possibly most importantly, is the fact that every piece used to construct Forcefield back protectors is CE approved. That means from the armor itself to the straps all the way down to the rivets; all CE certified. This gear will withstand the test of time and perform tremendously. We think you'll be pleased. You can compare it to other back protectors by visiting the back protectors page at RevZilla.com.